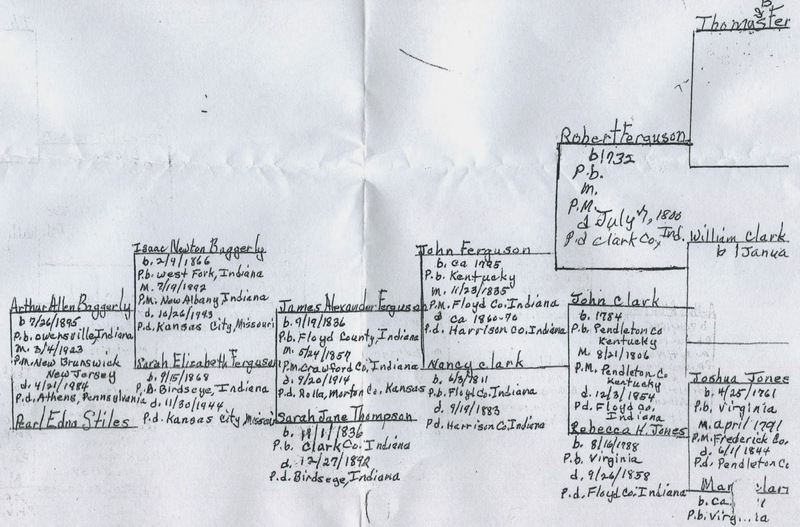 The Genealogy Center of the Allen County Public Library in Fort Wayne will hold a free class, "What's So Vital About Vital Records," on Monday, March 17 from 2 to 3 pm in the library's Meeting Room A. Delia Bourne will discuss how birth, marriage and death records can aid your research, how to locate them, and how to find supplemental records. This class is part of the library's annual "March Madness - Genealogy Style." This event is free - to register, e-mail Genealogy@ACPL.Info or call (260) 421-1225. We received a rare query via the Post Office from a 90-year-old researcher in Texas. 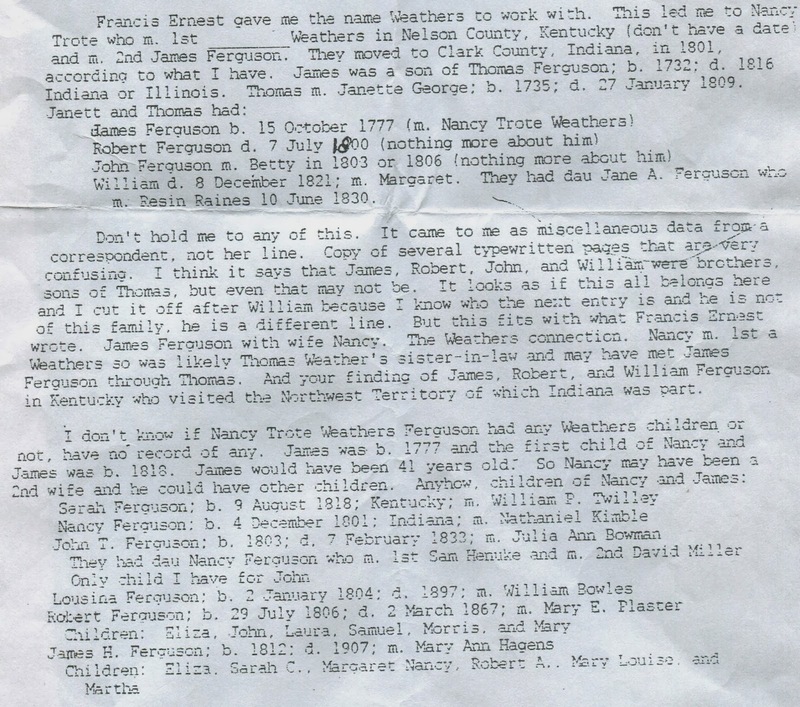 Edna Schultze has two documents with Ferguson information, and she wants to know if there is a connection that some sharp researcher can see or someone knows about. Take a look at the items below and contact Ms. Schultze at 205 East Avenue, Apt. 120, Schulenburg, TX 78956. The Genealogy Center of the Allen County Public Library in Fort Wayne will hold a free class, "Starting, or Starting Again: Having Fun Finding Family," on Sunday, March 16 from 1 to 2 pm in the library's Meeting Room A. Curt Witcher will show you numerous ways to engage more family members, collect more photographs and stories, and bring your family history to life. This class is part of the library's annual "March Madness - Genealogy Style." The Genealogy Center of the Allen County Public Library in Fort Wayne will hold a free program, "The Harvey Girls," on Friday, March 14 from 2 to 3 pm in the library's Meeting Room A. From the late 1880's through the 1960's, over 100,000 women moved to the southwest to work at the Harvey Houses along the Santa Fe Railway. These young women, ages 18 to 30, came to be waitresses, but remained in the area and were known as "Harvey Girls." This program is in honor of Women's History Month and will be led by Cynthia Theusch. The Genealogy Center of the Allen County Public Library in Fort Wayne will hold a free program, "Finding Her: Our Female Ancestor," on Thursday, March 13 from 2 to 3 pm in the library's Meeting Room A. The program is in honor of Women's History Month and will be led by Melissa Shimkus, who will discuss how to find a variety of records documenting women's lives. I am looking for the marriage record of Archibald S. DeButts and Eliza Jelliff. Census records indicate they were living in Union County, Indiana, in 1840 and had children at that time. I am not 100% certain they were married in Indiana, or if they moved to Indiana after their marriage. Upon moving into an older home I discovered a large photograph 32 1/2 in. by 5 1/2 in. The photo states, "Wells County Graduates 1917" and displays a large class of at least 200 men and women/boys and girls. The owner of the photo was a Ruby Myers, who was a 12 year-old eighth grader. The students are standing in front of a large building which looks like the courthouse of Bluffton, Indiana, in Wells County. I would like to learn any information available to go along with this photo. I would appreciate whatever you are able to supply. Thank you so much. Cyndi Ingle, author and creator of the Cyndi's List website, will lead a workshop at the Indiana Historical Society in Indianapolis on Saturday, March 22 from 10 am to 4 pm. The workshop, titled "Genealogy Online: Productive, Organized and Successful," will lead you through the process of creating a research plan using online tools and services such as Evernote, Ancestry, FamilySearch, Cyndi's List and more. Learn how to keep yourself organized and on task, as well as how to write effective communications and research notes. The workshop will touch on a wide variety of online sources and tools, including social networking, databases and records repositories. Registration is $32 for Indiana Historical Society members, $40 for non-members, and includes a box lunch and free parking. For Indiana librarians, the workshop is eligible for 5 technology LEU credits. For more information, or to register, visit http://www.indianahistory.org/genealogy-online-productive-organized-and-successful or phone (317) 232-1882. The Indiana Genealogical Society now has 1,226 databases in the Members Only area. Each of Indiana's 92 counties has at least 5 databases. I am researching an Alexander Wilson, born about 1803-1810 in Indiana (or Kentucky) . Working on Indiana right now! Family Search indicates he was born 1803 in/near Martinsville, Morgan County, Indiana, and that he was christened in 1808. He died in Monroe County, Indiana, 1862. Can you help me with any information about him? Thanks very much! Query: Research In Merrillville Library?